Knock Knock. haha, voldy!!!. Wallpaper and background images in the Harry Potter club tagged: harry potter draco voldemort joke. This Harry Potter fan art contains dấu hiệu, poster, văn bản, bảng đen, and ký hiệu. There might also be chân dung, headshot, and closeup. 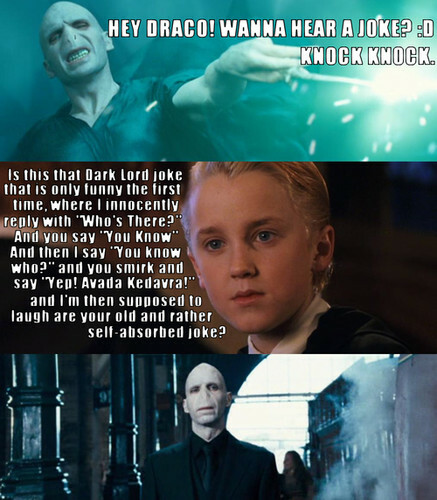 oooooo, voldy got burned by 11 year old draco! BURN! ^I know right? I had it on a magnet inside my locker last year.